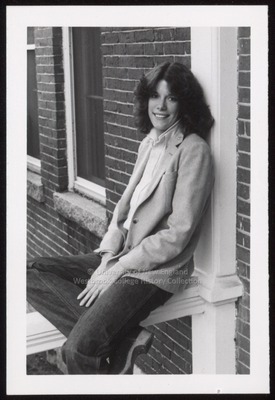 "Cheryl Parker, Westbrook College, Late 1970s"
Westbrook College student Cheryl Parker sits on a Hersey Hall railing in this late 1970s black and white, senior class candid photo. Cheryl wore blue jeans, a striped shirt, a pale colored wool jacket and wooden clogs. Her hair was shoulder length and curly, and parted in the middle.